I have been longing for making focaccia about few months ago, but I was able to made it just about a couple of weeks ago. 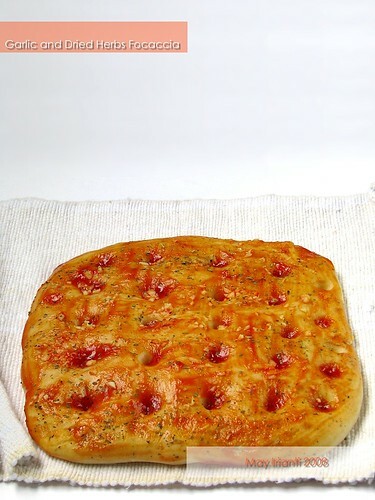 It was first time I made focaccia. But it was totally failed. The dough was not rised at all, though I had rested it for three hours. I suspected the yeast wasn't fresh and didn't worked as it should be. But the more I failed, the more I felt curious. So I made it again last week. I forgot where exactly I found this recipe. It just bended for a long time in my recipe bundle. But actually, I didn't took a lot of notice at the recipe, since I made a lot of adjustment. Last sunday, my hubby's off duty day, and he enjoyed relaxing at home. Then I made him this focaccia. I started making this after breakfast and finished after lunch. It took time about 3 - 4 hours, from mixed the dough, rested it, rolled it, rested it again, and baked it, until I can served it on our dining table. But it only took a few minutes to emptied the pan, and cleaned the dish. I was only had a slice, my daughter was had a slice too, and my hubby took the rest. In a bowl, combine the flour and salt and mix thoroughly. In separate bowl, combine water and yeast. Let rest for 5 minutes. Pour the oil into the yeast mixture, stirred well. Make a hole in the center of the fluor, then pour yeast mixture into the hole. Stir to combine well into a sticky mass. Pour this mass out onto a lightly floured surface and begin to knead the dough by working the dough with the heel of the palm of your hand. Add some flour lightly if the dough still sticky, otherwise rub your hand with a litlle bit of oil if your dough too dry. Than continue knead until you have a smooth ball of dough free of stickness. Place the ball of dough into a clean bowl brushed with oil. Cover with a clean cloth ( or plastic ) and let rise for 1 1/2 hour or until it has doubled in size. Release the air of the doubled sized dough, and rolling down the dough into the focaccia shape ( commonly square ). Let rise until it has doubled size again. Dip a tip of your finger into the oil and dimple the dough, then add your seasoning, herbs, tomatoes or olive oil, or any seasoning you like. 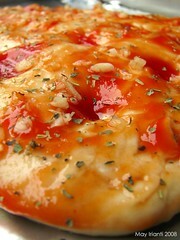 *I spread tomato ketchup over the dough, pouring chopped garlic and dried herbs. Bake for about 15-20 minutes or until golden brown. Serve warm. You can make a lot variation of focaccia seasoning/ topping. You may add onion or grated cheese, sliced mozarella, or permesan if you like, or add sun dried tomatoes, or maybe cayenne pepper if you wish it hot, or even pepperoni so it will turn into pizza. 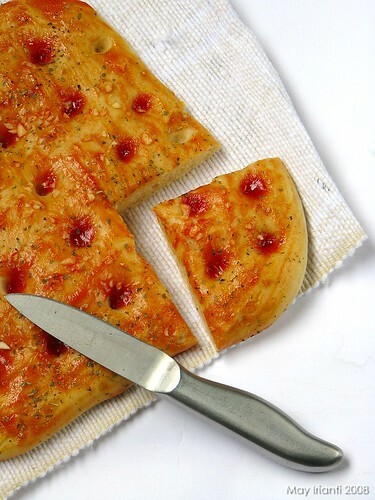 Just try it and make your own focaccia in many style! This morning, my hubby asked me to made focaccia again. I made a little different seasoning/ topping. I'll post it later, since I'm feeling a little bit tired right now. Mbak, pake bahasa indo donk. Huhu.. aku kurang gape nih inggrisnya. Padahal udah ngiler ngeces pengen nyobain.